Track the vital signs of your organ perfusion study or hollow fiber bioreactor system. Indispensable for monitoring hollow fiber and other continuous flow bioreactors. IDEAL FOR ORGAN PERFUSION STUDIES. The Ultra-P micro flow through electrodes for pH, pO2, and pCO2 are ideally suited for perfusion studies in liver, kidney, heart, lung, and other perfused organ systems. USED IN CELL PERFUSION STUDIES. 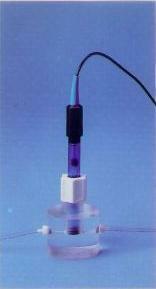 The Micro flow through electrodes can also be used in cell perfusion studies of various animal and plant cells. ALL BIOCOMPATIBLE COMPONENTS. All electrode components are made of glass, fluoropolymer, acrylic, and epoxy and are completely compatible with perfusate media. LOW VOLUME FLOW THROUGH SYSTEMS. All flow through electrodes have low internal volumes and are designed for flow rates between 1 and 150 ml per minute. USE WITH SILASTIC OR OTHER FLEXIBLE TUBING. Electrodes come with hose barb end fitting. Just slip the silastic or other tubing over the hose barb fitting for a leak free connection. OPTICALLY CLEAR FLOW CELLS. Optically clear flow cells make for simple visual bubble detection and bubble elimination. CONTINUOUSLY RECORD PH, PO2, AND PCO2. The pO2 flow-through module plugs directly into any standard strip chart recorder for continuous recording. The pH and pCO2 flow-through modules can be interfaced to a strip chart recorder using a Lazar pH/millivolt meter or any standard laboratory pH/millivolt meter. RAPID RESPONSE. Response time for all the flow through electrodes is less than 30 seconds for a 50% increase in the parameter being monitored. Connector Cable: Available in U.S. Standard, BNC, Radiometer, * or other common pH meter connectors. Standard 30 inch cable length. Specify connector type when ordering. Response Time: Less than 10 seconds per pH unit. Fluid Flow Fittings: Miniature hose barb connectors compatible with standard size silastic or other types of flexible tubing. pO2 range: 0 to 760 Hg. Connector Cable: Available in dual banana plug for Interface with strip chart recorder or U.S. Standard, BNC, or Radiometer* plug for Interrace with pH meter. 30 inch cable length. Specify connector type when ordering. Fluid Flow Fittings: Miniature hose barb connectors compatible with standard silastic or other types of flexible tubing. pCO2 range: 0 to 500 mm Hg. Connector Cable: Available in U.S. Standard, BNC, or Radiometer* or other common pH meter connectors. 30 inch cable length. Specify connector type when ordering. Response Time: Less than 20 seconds for 100 mm Hg change. 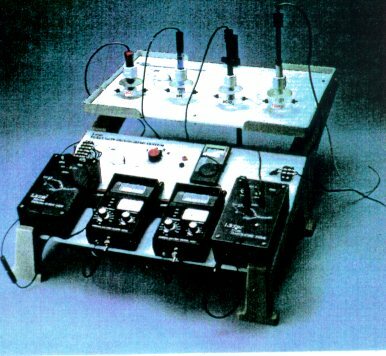 Complete 3 parameter monitoring system including pH, pO2, and pCO2 flow-through modules consisting of mcro electrodes and micro flow through cells with input and output ports; separate analyzer with RS232 output for each of the three parameters pH pO2, and pCO2; RS232 to USB converter which combines the 3 signals from the analyzers and plugs into the USB port of PC; and complete software program for monitoring, recording, and plotting all three parameters on a PC.